A bit over one month after the 7-inch Samsung Galaxy Tab 3 was made official, the Korean tech giant now announced a 10.1-inch member of the series. The 10.1-inch Samsung Galaxy Tab 3 comes with a 1280 by 800 pixel TFT display, 1GB of RAM, 3MP main camera, 1.3MP front-facing snapper, and either 16 or 32GB of on-board storage that can be expanded with the use of a microSD card. Android 4.2 is pre-loaded, with the usual UI modifications in the form of Samsung's TouchWiz interface. The Samsung Galaxy Tab 3 10.1 also stands out with being very portable, with a thickness of under 8 millimeters and tipping the scales at 510 grams. Versions with 3G/4G cellular connectivity will be available as well. 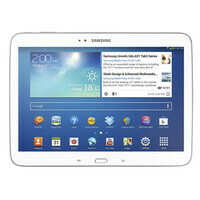 Details about pricing and availability of the 10.1-inch Samsung Galaxy Tab 3 have yet to be announced. SEOUL, Korea, June 03, 2013 - Samsung Electronics Co., Ltd, a global leader in digital media and digital convergence technologies, today announced the introduction of the GALAXY Tab 3 8-inch and 10.1-inch which will be available globally beginning of June. Offering an expanded range of options along with previously announced 7-inch version, the GALAXY Tab 3 Series provides customers various ways to view, listen, create, and share meaningful events and special content with those who matter most. Whether surfing the web at home or reading during the commute, each device is packed with enhanced content and intuitive design perfect for viewing or sharing content with friends and family, and capturing all of life’s spontaneous moments. lighting conditions work better on its 8-inch screen. Samsung’s Sound Alive for Audio and Dolby Surround for Video Play maximize every sound allow users to enjoy clearer dialogue, consistent volume levels, and superior audio to further enhance the overall multimedia experience with the new device. Also, the physical keys on the bezel at bottom give users a comfortable smartphone-like experience in navigating. enjoyed by the whole family. Oh my god, really Samsung? A 10.1 inch tablet with a physical button and two capacitive buttons? This tablet is ugly. They should have used on screen buttons. What if you're in portrait mode? you still have to reach out for those small buttons. What was samsung thinking when making this tablet?For all galaxies to look a like? Thats what custom roms are for. Just get Asus memo pad FHD and save all the trouble. Very disappointed with Samsung tab 3. Yeah, they should have used on screen buttons! What the hell is Samsung thinking? Theres still hope for an updated nexus 10 later this year. The new asus infinity looks way better than this, all samsung really put in this thats good is intel. what would you expect?? samesung will never be able to make a great design... thats why they always copy others, and put gimmicky stuffs to attract stupid buyers. it's a photocopy yes, but calling them copycats is a bit cliche now. 3 years ago maybe? Is Samsung inspired by its design? Why the hell they don't change the design? And the most uninspiring design department of the year goes to ... *drumroll* Samsung! I find funny that people say Apple recycles their designs while their favorite manufacturer Samsung is doing the same, a billion times, so far every galaxy in 2013 looks the same. This is major win for intel, right now this is as good as a15. The Silvermont cpus coming later this year are 2-3x the power of a15. Tablet is ugly, but I'm glad to see Intel coming more to the mobile market! Amd is coming in very soon too competition = better products. Poor res, only 1GB of RAM and a just another copy and paste design. Like have they surpassed their 2000th photocopying machine yet? Its a budget tablet not a $500 one. Tablet of the Year. :) Samsung FTW. Actually tablet of the year goes to the Haswell tablets running windows 8. If you like Samsung products they will probably release some eventually with haswell + windows 8. Cannot wait for a well prices haswell 7-8inch win8 tablet with a hdmi/fullsize usb on it. Tablet of the Year? Are you kidding me? Well, I think he is wendygarett. Tablet of the decade :) SANSUNG FTW.